Springfield Receives Readers' Choice Award... Again! 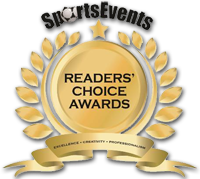 Springfield Missouri Sports Commission and Springfield Convention & Visitors Bureau (CVB) are winners of the 2014 class of SportsEvents Media Group Readers’ Choice Awards! This is the third year in a row that the award has been won by the two groups. “It was an honor to be nominated by our peers for the award and even a greater honor to receive the award from SportsEvents Magazine,” Lance Kettering, executive director of the Springfield Sports Commission said. Sports event professionals are asked to name the sports commission, CVBs or sports events venues that they believe display exemplary creativity and professionalism toward the groups they host. Nominations are received from readers throughout the year, and the top picks are selected based on the results from an online voting system. For more information about the Springfield CVB, Sports Commission and sports events in Springfield, call 881-5300 and visit www.SpringfieldMoSports.org andwww.SpringfieldMo.org. The CVB and Sports Commission are nonprofit marketing organizations dedicated to generating economic growth in Springfield through the travel and tourism industry.